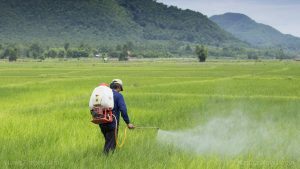 Atrazine is a selective triazine herbicide that is used to control broadleaf weeds and grassy weeds in crops, such as corn, sorghum, sugarcane, pineapple, and Christmas trees, and in conifer reforestation plantings. In addition, it is also used as a non-selective herbicide on non-cropped industrial lands and on fallow lands. It is available in different formulations, such as dry flowable, flowable liquid, liquid, water dispersible granular, and wettable powder. This herbicide is classified as a Restricted Use Pesticide because it may contaminate groundwater. Atrazine has the molecular formula of C8H14ClN5. There are several known side effects of atrazine in humans. The chemical may cause allergic skin reaction through skin contact. It may also cause serious eye irritation through eye contact. If ingested, it may also irritate the mouth and stomach. Moreover, the chemical may cause damage to the body organs if an individual has been exposed to it for long periods of times or multiple times. Atrazine exposure can also cause abdominal pain, diarrhea and vomiting, eye irritation, and irritation of mucous membranes. In animal studies, it has been found to cause depression, slowed breathing, incoordination, muscle spasms, hypothermia, muscular weakness, hypoactivity, breathing difficulty, prostration, convulsions and death. Atrazine has also been found to cause endocrine disruption and reproductive effects such as increased risk of miscarriage, reduced male fertility, low birth weight, and birth defects. The environmental harm that atrazine can cause is that it is very toxic to aquatic organisms. It has also been found to be slightly toxic to birds. The body systems affected by atrazine include the integumentary, ocular, respiratory, digestive, muscular, nervous, endocrine, and reproductive systems. Atrazine can be found in herbicide products that are used to control broad-leaf weeds and grassy weeds in crops, such as corn, sorghum, sugarcane, pineapple, and Christmas trees, and in conifer reforestation plantings. Some of the brand names that contain atrazine include G-30027, Aatrex, Aktikon, Alazine, Atred, Atranex, Atrataf, Atratol, Azinotox, Crisazina, Farmco Atrazine, Gesaprim, Giffex 4L, Malermais, Primatol, Simazat, and Zeaphos. There are several ways on how to avoid or reduce exposure to atrazine. One way to reduce atrazine exposure is to avoid areas where it is being used on crops or for control of weeds. Another way is to avoid digging or working in soils where it has been used. Moreover, make sure that your water supply is free of the chemical. Do not swim in bodies of water or play in fields where atrazine has been applied. For individuals who work with atrazine, a way to reduce exposure is to wear proper clothing and protective gear and use the chemical according to the instructions. Atrazine, a selective triazine herbicide, is used to control broadleaf weeds and grassy weeds in crops, such as corn, sorghum, sugarcane, pineapple, and Christmas trees, and in conifer reforestation plantings. Atrazine may irritate the skin, eyes, and gastrointestinal tract. Atrazine may cause abdominal pain, diarrhea and vomiting, eye irritation, and irritation of mucous membranes. Atrazine adversely affects the integumentary, ocular, respiratory, digestive, muscular, nervous, endocrine, and reproductive systems. Atrazine is toxic to aquatic organisms and birds.